Why should I have a CV? You may ask. Well, it’s a marketing tool for yourself. Your CV is the first thing that a potential employer will see that represents you. The only thing that can be a problem with a CV is that it can be a mundane, repetitive tool that can look and sound the same; Especially if many people send lots of CVs to the same job position. You need to make your CV stand out! Whether that be the style or what skills and experience you decide to show. Just by making an effort with your CV, you will be immediately above average. 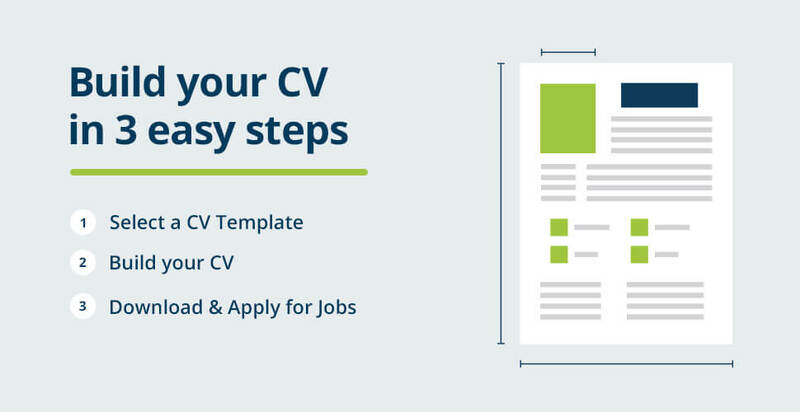 Our free CV Builder is a three-step process that guides you through easy stages for you to end up with a great looking CV. CV Builder is also a time-saving tool, allowing you to create the CV in a short amount of time meaning you can spend more time searching for jobs. The first step is to pick a CV template that relates to the formality of the job role you are applying for. Choose from many CV templates. Now, depending on what CV template you chose, you need to fill out the relative and current details. The last step is to download and view your brand-new CV. After that, you can send your CV PDF file to whoever you want or you can simply print it out. Because this is a PDF you can send it through email and upload it to job boards. Check there are no errors present in your CV. Get someone to check spelling and grammar if you are not sure. In this day and age, the internet is what you are most likely going to use to send off your CV. The recommended format is a PDF File or Word document. Skills that you don’t have but may claim to have will be found out eventually, so it’s recommended, to be honest with your CV. It’s normal to exaggerate certain aspects of a CV, however, make sure you can back up what you’ve written. If you already have a CV it’s important that you update it regularly with those great achievements you keep gaining. Updating your CV allows you to respond swiftly to job opportunities and allows you to customise information about yourself to make your CV better. Hopefully, this free CV Builder tool will benefit you and the CV you create serves you well in the job searching process.